I feel very fortunate to have been gifted a large amount of delicious pomegranates the other day. Since I had so many pomegranates, I was looking for ideas of things to do with them. I made a fennel salad with lemon, olive oil, salt, and pomegranate arils/seeds. I made delicious pomegranate chicken with pomegranate seeds, onions, salt, and garlic. I roasted pumpkin with cinnamon and olive oil and sprinkled it with pomegranate seeds before serving. And I also made homemade jello, adding pears and pomegrates to it before chilling. But the one thing my freinds kept on suggesting for me to make when I asked for suggestions of things to do with pomegranates was making chocolate bark. I looked up and found a whole bunch of different types of recipes, and this is what I threw together using what I had in the house. It came out so amazingly; the combination of flavors and textures was simply delectable. While I made mine with exactly what was written below, this recipe is flexible, and if you don't have or can't use any of the ingredients listed, feel free to replace them with something else. I made my pomegranate bark frozen. It actually was an accident that it was frozen- I simply stuck it in the freezer to chill/harden quickly since I was working with a clock, and then forgot the pomegranate bark in there too long, until it froze completely solid. I didn't attempt to defrost it since the arils probably would lose their texture once defrosted, but I have to say that it was just so delicious frozen that I think future times I make this, I will intentionally make it frozen, because it was even more of a treat, in my opinion, that way. This recipe is good for so many different types of diets, from gluten free to paleo to vegan, etc... and the best part of it is that it's pretty easy to make as well. 1. Separate the pomegranate seeds from the pith. Usually I do this in a bowl of water, but for this recipe do it without the water, as water causes melted chocolate to separate. Put your pomegranate divided into two smallish lined baking pans or one very large lined baking pan. 2. Heat up your chocolate in a double boiler. When mostly melted, add the coconut oil, melt it, and mix it in thoroughly. 3. Sprinkle the almond slivers and craisins among the pomegranate seeds, making sure that they're relatively evenly distributed, and then mix them up. 4. Pour the melted chocolate over the pomegranate mixture, spreading it out so the entire pan gets filled with chocolate, and then mixing it together with the pomegranate mixture. 5. Chill, either in the fridge or freezer. 6. Once hardened, break the chocolate bark into bite sized peices, and serve. Are you a fan of pomegranates? What is your favorite way to prepare them? 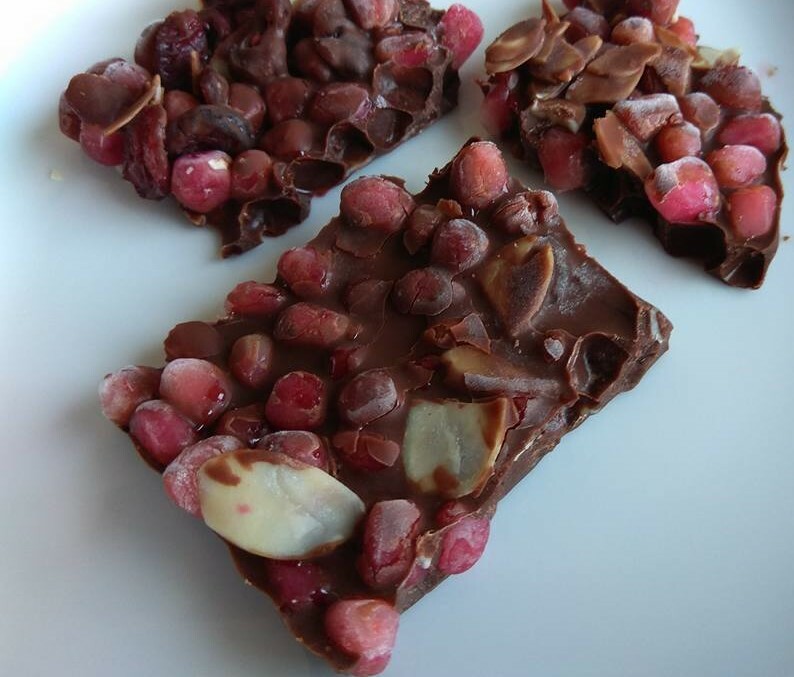 Have you ever had pomegranate chocolate bark? Does this look like a recipe you'd try?